This island is located on the coast of Maine about 7 miles south of Brunswick, Maine heading south on Route 24. It is part of the Town of Harpswell, Maine. The island is almost 5 miles long and 5 miles wide. It is located about 43 miles from Portland, Maine. It is north of Orr's Island and south of Brunswick. Cundy's Harbor. 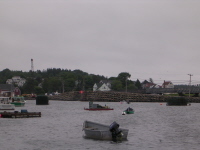 A working fishermen's harbor. Has a souvenir shop, general store, and restaurant selling sandwiches and fish dinners. Casco Bay Lines Nature Cruise. Takes place at noon-time. Runs from end of July to Labor Day. Catch the ride on the northern tip of Bailey Island near the public boat ramp and Cooks Lobster House. From I-295 take the Topsham exit. Continue on to Route 1. Take the first exit at Cooks Corner. Take Route 24 South. It is about 12 miles south of Brunswick / Topsham area.